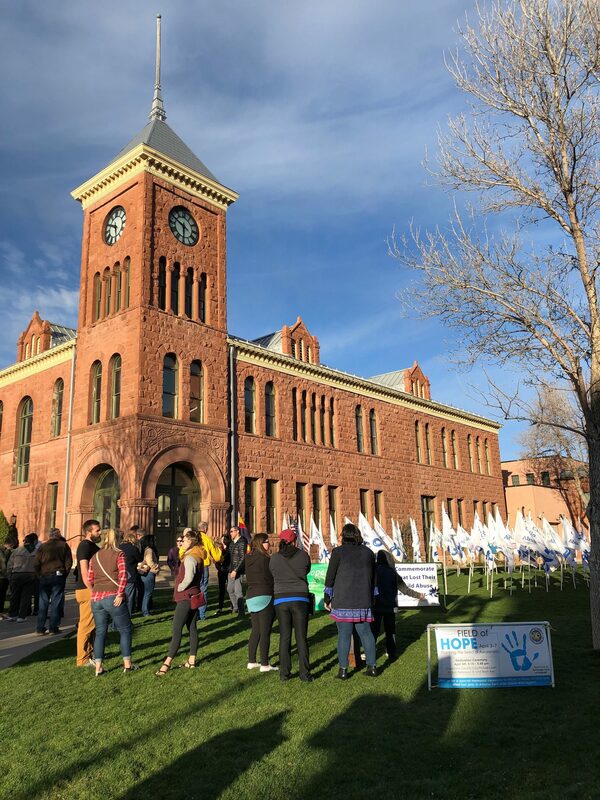 The always moving Field of Hope Dedication put a poignant focus on annual Child Abuse Prevention Month efforts throughout Coconino County. More than 50 local residents gathered for the ceremony presented by the Exchange Club of Flagstaff on Friday, April 5, 2019 at the Coconino County Courthouse lawn. This year, the event paid tribute to the 79 children who died last year in Arizona from child abuse and neglect, with the hope the number will continue to decrease each year. The 79 flags were on display at the Coconino County Courthouse lawn through April 7. The ceremony included the opening welcome by Cheryl Coranado-Bruton, president of the Exchange Club of Flagstaff, the Presentation of Colors by Boy Scout Troop 33, the singing of the Star Spangled Banner by Betty Goodwin, the City of Flagstaff proclamation of April as Child Abuse Prevention Month by city council members Charlie Odegaard and Regina Salas, the Coconino County proclamation of April as Child Abuse Prevention Month by Supervisor Art Babbott, the Placement of the Flags by attendees, the Ringing of the Bell 79 times in remembrance of the 79 children, keynote addresses by Coconino County Sheriff Jim Driscoll and CCC&Y Executive Director Virginia Watahomigie, and the Benediction by Monite Vergel de Dios. Mitch Strohman served as master of ceremonies. Visit http://www.flagstaffexchangeclub.com/content/field-hope or http://www.flagstaffexchangeclub.com/content/contact-us for more information. Child Abuse Prevention Month kicked off in April with the reading of the official proclamation by the City of Flagstaff at its regular City Council meeting on Tuesday, April 2, 2019. The proclamation was presented to CCC&Y Executive Director Virginia Watahomigie by members of the Flagstaff City Council and Mayor Coral Evans. Following the presentation, supporters of the Coalition gathered for a group photo. This is the second official recognition this year of April as Child Abuse Prevention Month. The Coconino County Board of Supervisors proclaimed April 2019 as Child Abuse Prevention Month during a ceremony held March 26, 2019 at the county’s First Floor Board Room. Reading the proclamation was Watahomigie. Also in attendance were Coalition board members and supporters. The evening presentation followed a morning session where Watahomigie provided supervisors with an update on the Coalition’s trauma initiatives countywide. April 10 — CPLC Parenting Arizona will hold its next Child Abuse Prevention meeting on Wednesday, April 10 at the Tuba City Public Library, 78 Main St., Tuba City. “This will be great time to discuss any community events that will be happening in April,” said Ophelia Goatson, program supervisor for CPLA Parenting Arizona. “Feel free to let me know if you have any questions.” The CAP meeting will be held after the monthly Tuba City Networking Meetingfrom 9 to 11 a.m. Send an email to to ophelia.goatson@parentingaz.org or call 928-773-9133 for more information. 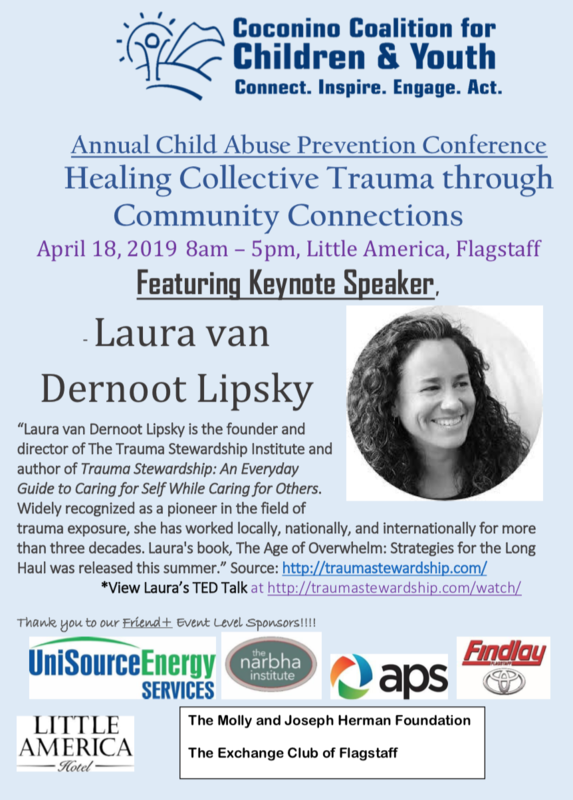 April 18 — Reservations have closed for the Coconino Coalition for Children & Youth’s 2019 Child Abuse Prevention Conference and Luncheon from 8 a.m. to 5 p.m. Thursday, April 18 at Little America Hotel, 2515 E. Butler Ave., Flagstaff. The event features keynote speaker Laura van Dernoot Lipsky of the Trauma Stewardship Institute, the presentation of the 2019 Caring for Children Awards to Elizabeth “Liz” Archuleta, Dani O’Connell, Joe Gutierrez, Shawni Parafiniuk, Jose Soto and Debbie Winlock; and the luncheon keynote discussion by Dr. Pearl Yellowman, executive director of the Navajo Nation Department of Community Development. Visit https://coconinokids.org/2019-annual-child-abuse-prevention-conference/ or send an email to virginia@coconinokids.org for more information.